While specify gravity is rarely going to change on a day-to-day basis, it’s a very simple process to measure and since the amount of salt is in your water is pivotal to the business, we check it daily. Perhaps the most important part of float tank maintenance is keeping the water medically safe. If the parts per million of H²O² falls below zero, bacteria can grow. If those levels fall to zero overnight, you may there is a strong odor coming from the water the next morning. It can take over a gallon of H²O² to reboot your water. To avoid this, make sure that you always have appropriate amounts of H²O² in your water. We test this in the morning and at night. We use QuantoFix test strips in the morning and night. We purchase our H²O² from Pure Health Discounts. This might seem a little odd as there is a temperature readout hooked up to every float tank I’ve ever heard of, but believe me this is a good idea for two reasons. First, your tanks readout may slowly become more and more inaccurate and may need re-adjustment or calibration. Secondly, your sensor could fall out or your temperature gauge could go so wildly off track that your water stops heating or heats to scalding hot temperatures (we came in once to the latter and had to make emergency runs to the store getting bags of ice. We were able to drop the temperature in time for our first float of the day!). We use a Stem Thermometer for quick and easy checks in the morning. pH and Alkalinity are important to make sure your water is safe for people to float in and to make sure there is no discoloration of your water. These levels tend not to drastically change daily, so measure them two times a week just to make sure they are within safe limits. Simply making sure you are offering consistent water levels is important. If you would like to make sure you have a consistent room temperature, I would recommend checking it every day. After we take our readings, we re-enter them into Helm, a float center service offered by Float On. 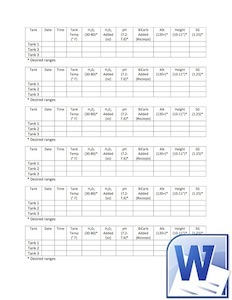 You can download a PDF version of our water data tracking sheet as well as an editable word file so that you can add tank names, add different measurements, etc. Thanks again for another wonderful post and accompanying video Dylan!! I’m ordering my tank next week so I’m excited to learn as much as possible about what we need on hand to maintain water quality and public safety. I know the specific gravity is ideal at 1.25 (thank YOU for that information) but in your experience, what is the ideal ppm for hydrogen peroxide? And how is that represented on the test strips? Same with alkalinity. As always, thank you so much for taking the time to share your knowledge and experience. I can’t wait to join the community as a float center owner/operator very soon and look forward to giving back in any way I can! Definitely good questions Jen. Based on the feedback of this post, I will make another post in the next few weeks that covers the measurements of our chemicals. 2 weeks after adding salt/water to your tank I swear you will be a chemist! While you’re at it, what do you use to measure alkalinity? * What do you do if the pH is off? It looks like you add bicarbonate if it’s low, but what if it’s high? Or does that never happen? Hi Colin, I’ll definitely cover this in another post, but I would say 1.23 is as low as you would ever want to go. In fact, if it’s that low, our tanks need salt. I would say 1.28 would be a maximum amount, but I can’t think of ever getting our SG that high. I am curious about dumping a load of salt from a tank, if you are hooked up to a septic tank and/or field. Would the salt kill the process you are hoping is occurring in the septic tank? I ask because I am thinking of moving to an island where septic tanks/fields are the norm. I know salt can be helpful for fertilizing your soil, but I don’t have an answer for this one. I would definitely need to know more about how your septic system operates. I think you just ran into the “this is a whole new world” edge of the float industry where nobody has the answers to the questions we have. No one has ever dealt with this amount of liquid salt before and in the ways we want to use it. Feel free to email me with more info about your potential septic system and I’ll do my best to provide any insight I can! Well done! Thank you for the info! Hi Dylan – I’m wondering if you’re not using Chlorine – what happens to the Ammonia, organics and Urea which are obviously not broken down by the H2O2 – these compounds appear in floatation tanks from sweat, body oil, hair oil and urine – do you send your water away for independent laboratory analysis? Hi Tee Jay! These are really good questions. I am working on a post to address these water maintenance questions that should come out within the next few weeks. Thank you for posting! You can’t only use hydrogen peroxide as is doesn’t get rid of organics or ammonia – you need a disinfectant too – do your research – pH does not effect colour – if you have colour you have bacteria! 30 micron filters that you find in the floataway only filter our hairs not undissolved solids. Do your home work H202 is an oxidizer but not a disinfectant – you need either UV, Chlorine or Ozone with H202 to guarantee safe water. Hi Dylan, thanks for the great video, very useful information. I am from Sao Paulo, Brazil, and we just built our first float tank, and we are planning on starting a network to make it accessible to as many people as possible. I’d like to ask you a couple of questions, what’s the H2O2 level we should maintain in the tank water, how many parts per million, and also what’s the recommended pH for the water, and finally, what product to use to change the pH in case it’s not appropriate. Yesterday we used 100% hydrogen peroxide to clean the tank walls, and when it got to the water, the water turned brown, and after some filtration, yellowish. I’d greatly appreciate some advice in how to turn the water back to a clear color. 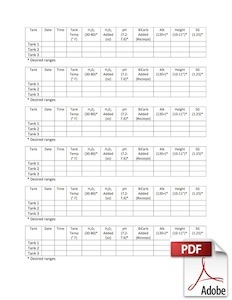 Target ranges for H2O2 (30-80ppm) and pH (7.2-7.6) as well as alkalinity and specific gravity are in Dylan’s sample worksheet. We’ve been using sodium carbonate (aka soda ash) to raise pH, and sodium bicarbonate (aka baking soda) to raise alkalinity. But if you go to a swimming pool supply shop you can find lots of “pH increaser” or “pH Up” products. As far as I know anything intended for a swimming pool, hot tub, or saltwater aquarium would be fine. Adding to that, usually your pH would be likely to be low, because when carbon dioxide dissolves into water out of the air, it creates carbonic acid. And I’m afraid I don’t know what the best way to clarify your water would be. If your problem is just “too much peroxide”, you might be able to just wait for it to break down into water and oxygen, as it will. I can say I was told by Graham Talley that at Float On they dilute their peroxide down to a 3 or 4% solution before using it to clean their tanks. It’s still disinfecting, but at that concentration no longer risks chemical burns on the person using it. Oi Fernando, vc poderia dizer onde seu tanque fica aqui em SP? I am a big fan of floating and would love to enjoy its benefits down here as well. Thanks! Our tank is llocated at Instituto Vector Equilibrium, we are about 3 Km away from the Butantã subway station. Our address is Rua Manuel Jacinto, 823, Vl. Sônia, tel. (11) 2594-3554, and here´s our website: http://www.vectorequilibrium.com. I´m looking forward to receive your visit. I had the opportunity of taking a session in a floatation tank in Guilford, CT yesterday. Although I had a very interesting and relaxing experience; I started getting very itchy last night. It started with my lower back and this morning it is all over my breasts and abdomin. It is very uncomfortable and has the feeling of Poison Ivy. Is this somethihng that occurs often and what can I do to relieve the discomfort. The Studio I attended is not returning my calls. Thank you. Hi Sheila, it’s very rare, but occasionally people do get itchy when they float. We’ve noticed a higher correlation of itchiness from people when they have been in chlorinated pools or hot tubs, but even then it’s not always the case. It is possible that the water had something in it that I am not aware of, but I wouldn’t want to speculate. We use Hydrogen Peroxide in our water, but it’s possible they you chlorine or bromine and you are allergic to that. I’m sorry they haven’t returned your phone calls though! I hope they get back to you and you are left with a better impression of floating. I was hoping u could help me with a problem I have been having with mold growing on and under the condensation flaps in my zen float tent. How do I get this under control? I use H2O2 as a sanitizer for the water. Keeping levels at 30ppm and the pump has a UV light. I’m not too happy with the filtration system and will be sealing it out for another one soon. In the mean time I have to get this mold under control. If you could give me some guidance it would be much appreciated. Thanks for your help. You actually did answer this for me before. I appreciate it. Thanks for posting all this information. I have a question that does not regard water maintenance.What do you use on your floors around the tanks or capsule so people will not slip and to kep the floor clean and free from salt. I would really appreciate your help. My specific gravity on my home tank is reading 80 .Never had it so low .I suspect my hydrometer is not working . I am adding epsom salt but it is not dissolving . Also my PH runs low because my well water is of low PH …any suggestions ? Hi, I am building a sensory deprivation tank and am unsure what filter and UV system to purchase. I have read a ton of research so am feeling cross-eyed stupid from too much info. What product/filter/UV/RO system do you suggest? Thank you in advance for any guidance. Thanks for the question! We had Lance and Amy answer it on the podcast for you, so give a listen to Episode 55 w/ Matthew Ganglof. I’m trying to compare conflicting test results on H2O2 concentrations. Using a Taylor Test Kit Drop Test, I get repeatable results of 135ppm in my flotation tank (yeah – it’s high). If I use 0-90ppm test strips, and precisly dilute the sample with fresh water to get within the strip test range, I get over 300ppm. Any idea why the results would vary? Thank you! My first question would be about how you are diluting it, that could affect the outcome. But even more important is that I don’t believe H2O2 can be tested accurately with test strips and I’m note even sure the Taylor Test Kit would be accurate. I think we will eventually figure out the proper way to get exact measurements, but until then I recommend a) letting your H2O2 drop (as you mentioned, it is high) and b) then testing with one or the other consistently. I think for now, the idea of consistency will be your biggest aid. Perhaps it won’t be a perfect number, but you will know that there is active h2O2 and that that it isn’t extremely high. This way if H2O2 numbers drop quickly you will know that there is an issue that requires attention. I asked a Taylor rep and got this reply, “In the grand scheme of all things “testing,” test strips are the least accurate. Most accurate is anything electronic (e.g., digital meters), then its titrations (aka drop tests like you have), then color-matching tests, and finally test strips. There are a number of reasons why the difference is there even if you take accuracy out of the mix: age of the strips, how the test was performed, was a sample taken 18″ below the surface or did you just swish the strip over the surface, etc. So, what I’m saying is that the results you obtained from the drop test are accurate and not from the test strips. Please tell me why aluminum free baking soda made pH of float tank water decrease? Could it matter that the baking soda was old?